There’s something magical and amazing about Hatch green chile season in southern New Mexico… Use your words Tamara. 😀 How to describe a roaster full of Hatch green chile? Smoky. Rich. Heady. Perfumy. (Is that even a word?) Every year I said the same thing: “Why can’t we bottle this smell to enjoy year ’round?” Mmmm. There’s just nothing like it. Having left New Mexico in the summer of 2015, I’m missing my 3rd Hatch green chile season. I guess I can’t expect you to “get it,” unless you’ve experienced it yourself. However, many parts of the country are now able to find Hatch green chiles, some are lucky enough to enjoy a Hatch chile festival and get a sack (or three) roasted. Don’t assume all Hatch green chile is “equal.” The Chile Pepper Institute at New Mexico State University rates New Mexico chile heat levels from 0-7,000 scoville units. We almost always got two 30-40 pound sacks of “medium.” Some years it had no heat, and some years we had to toss it by Christmas… Which brings me to my next important point. Warning: Green chile gets hotter in the freezer! Yes. It. Does. Have you experience Hatch green chile? Are you an addict like me? I would love to hear from you! 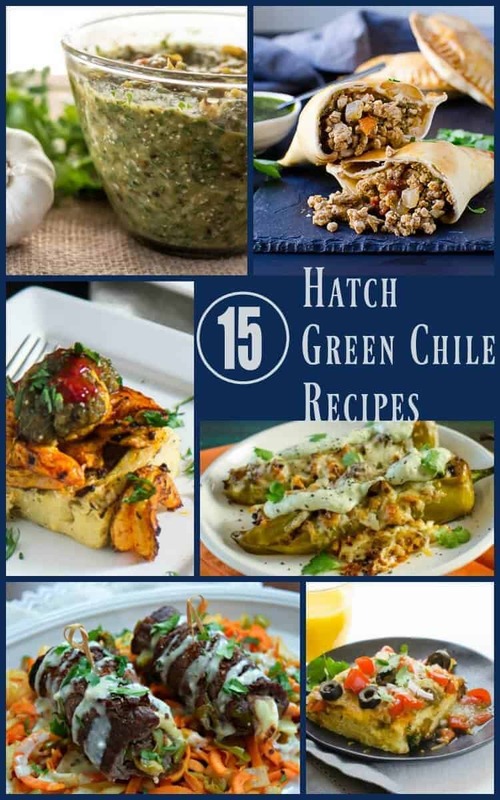 Today I bring you a collection of excellent Hatch green chile recipes to inspire you. If you can’t find fresh, you may find fresh-frozen chile at your market. You can also order high-quality fresh ones online. If you’re not sure what to do with the fresh ones, click through to Roasting and Peeling Instructions. 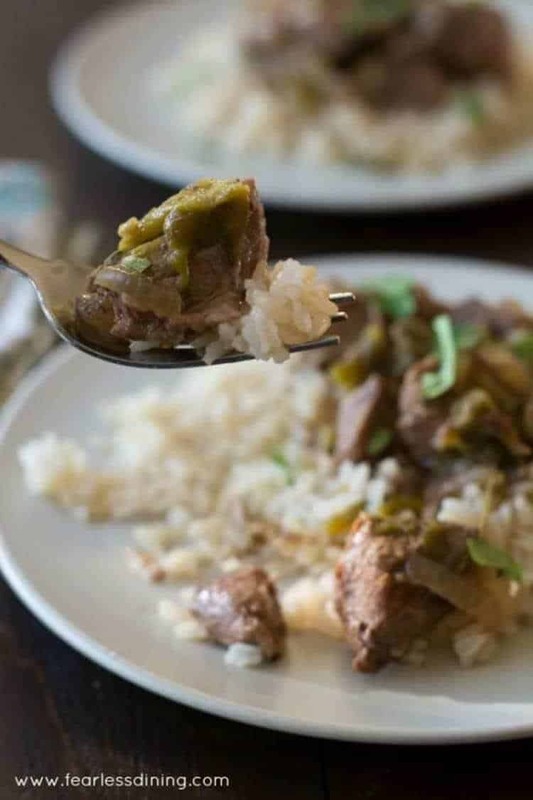 If you need more inspiration, check out my friend Sandi Gaertner’s 10 DELICIOUS HATCH CHILE RECIPES AND HOW TO ROAST THEM! This excellent post also includes a video for blistering your Hatch chiles on the grill! 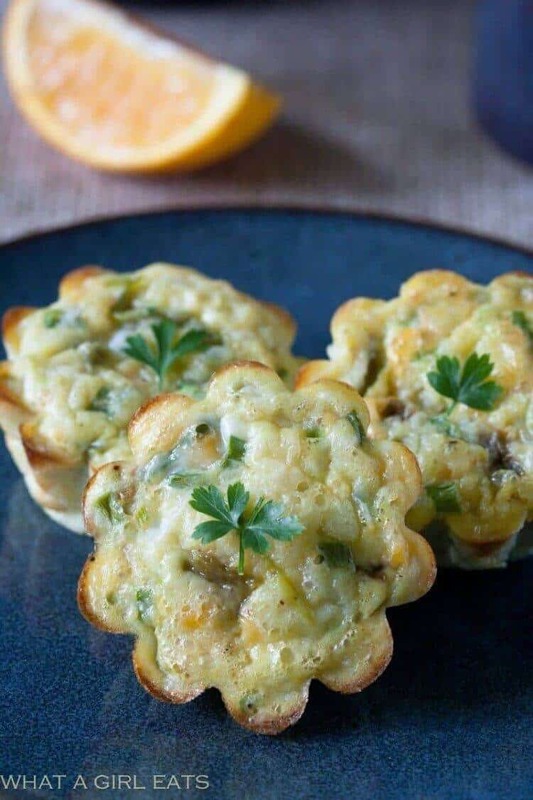 Hatch Chile Cheddar Egg Bites make the perfect low-carb, high protein and gluten-free breakfast! 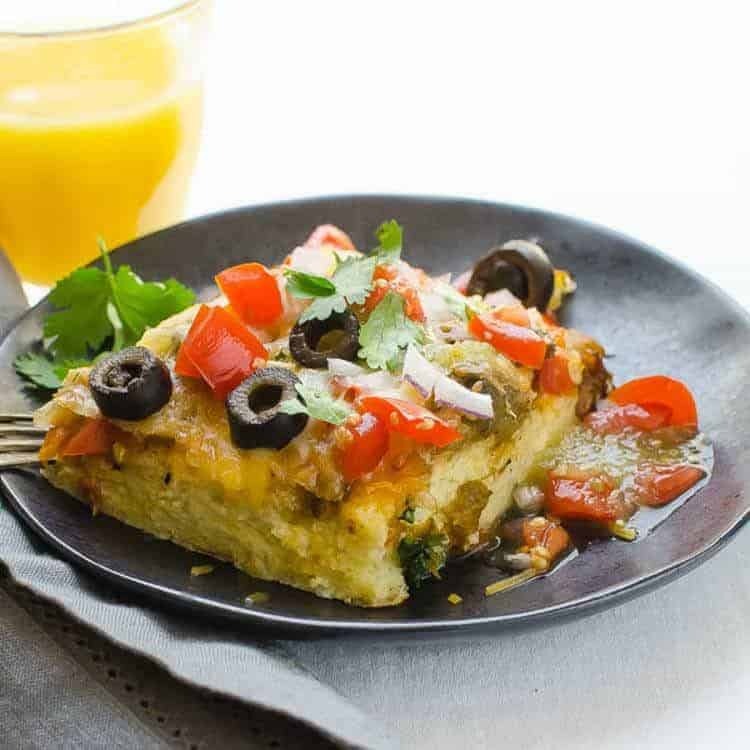 A delicious make-ahead breakfast that feeds a crowd! 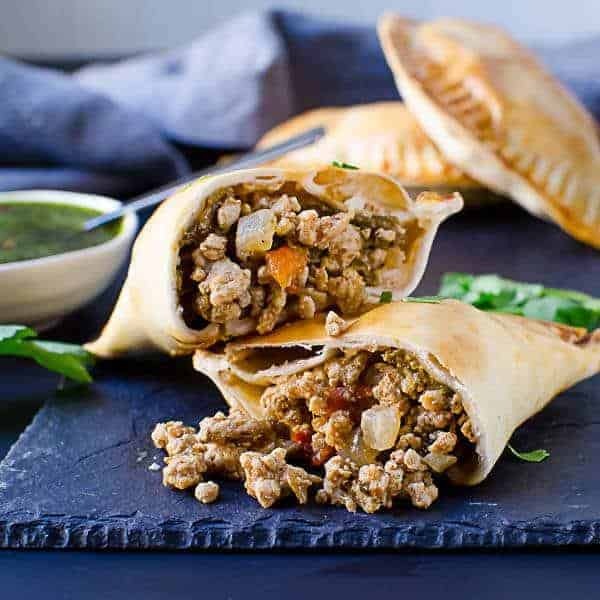 Spiced, savory pork empanadas with a kick of fire roasted hatch chiles and a fresh herb sauce! Easier than you think to make! Delicious! 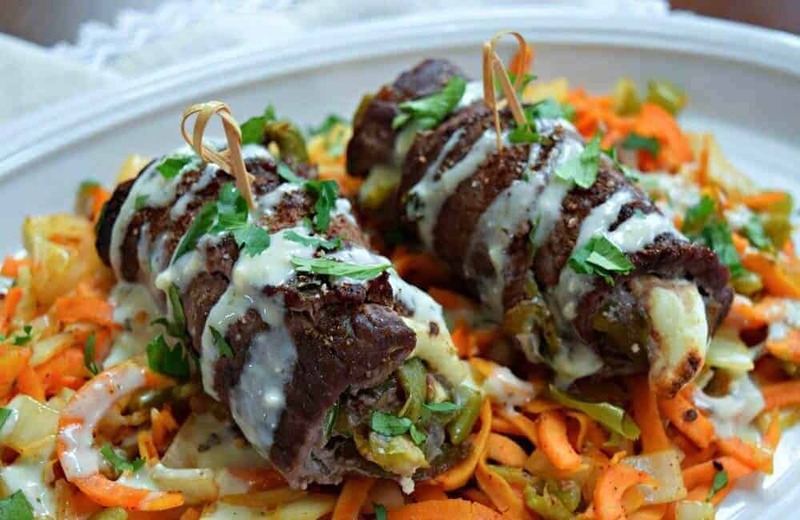 A healthy, vibrant dish with flavors of New Mexico and the desert southwest! 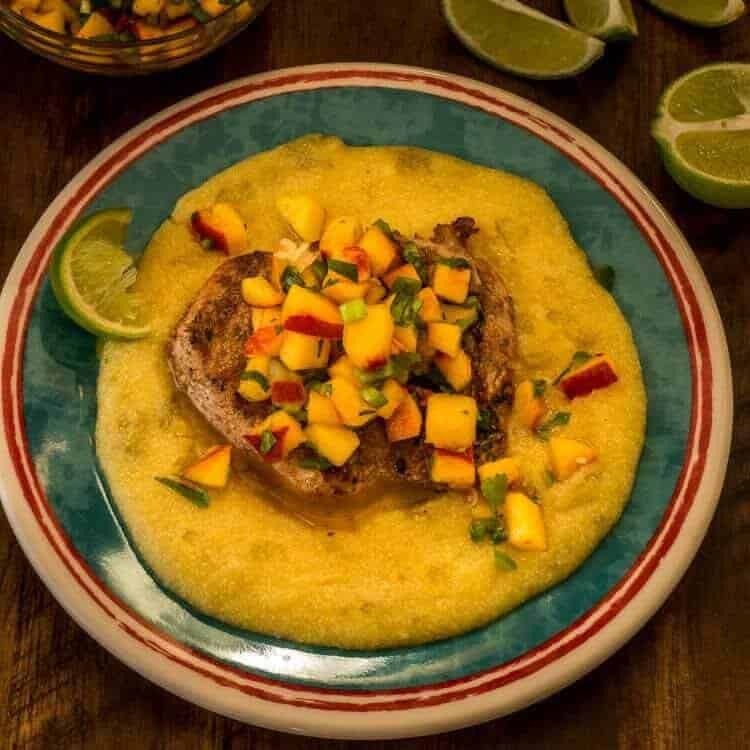 Grilled Pork Chops with Hatch Green Chile Polenta combines a green chile flecked polenta with a cumin-rubbed and grilled pork chop, and it all gets topped with a picante peach salsa… Buen provecho! 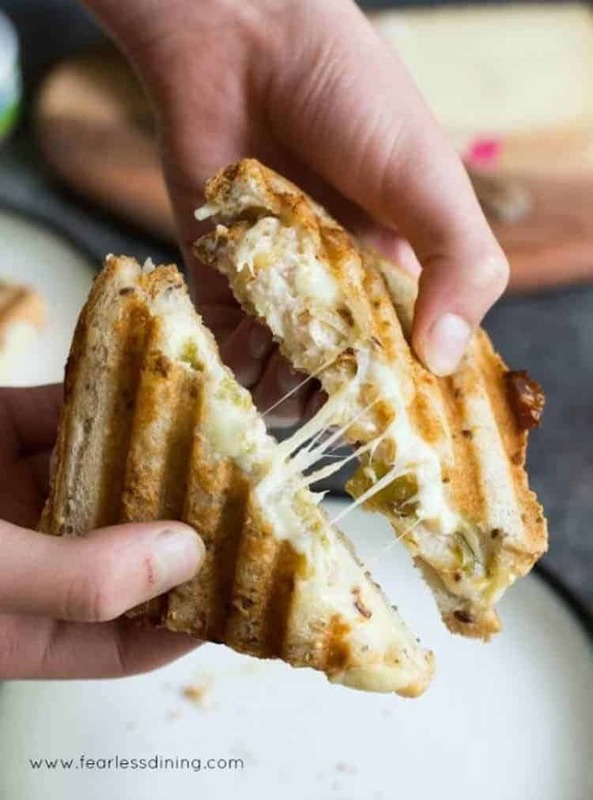 This Tuna Melt Panini is loaded with grilled onion and fire-roasted Hatch chiles. The melty cheese and spice blend in with the tuna to this the best tuna melt sandwich ever! 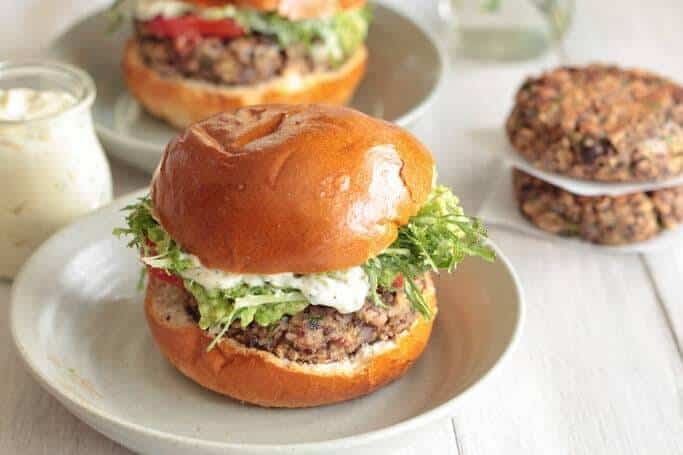 These hearty Black Bean Shiitake Burgers with a spicy Hatch chile mayonnaise are the way to go when you want a satisfying veggie burger with a little kick! 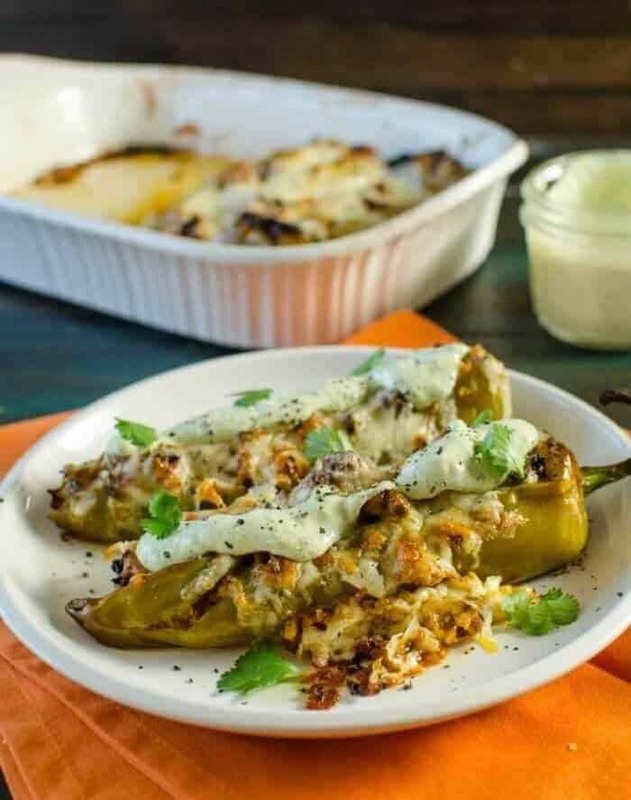 Spicy, smoky, a little sweet, a lot succulent – Spiced Pork Stuffed Hatch Chile is great as a party entrée, main meal or regular weeknight dinner. 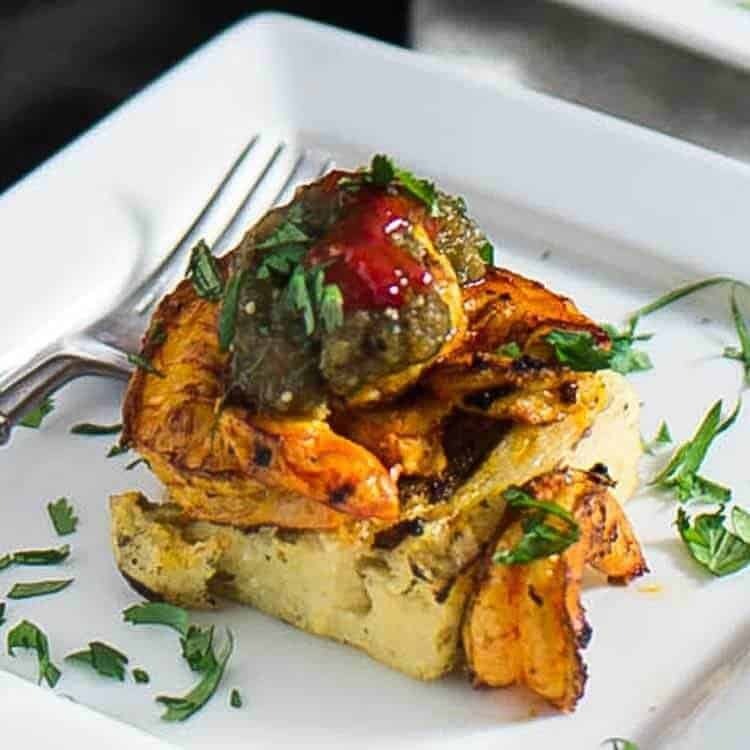 Incredibly delicious and super easy to make! Great way to use up hatch chiles, and if you don’t have access to those, simply substitute with anaheim, poblano or even green bell peppers. 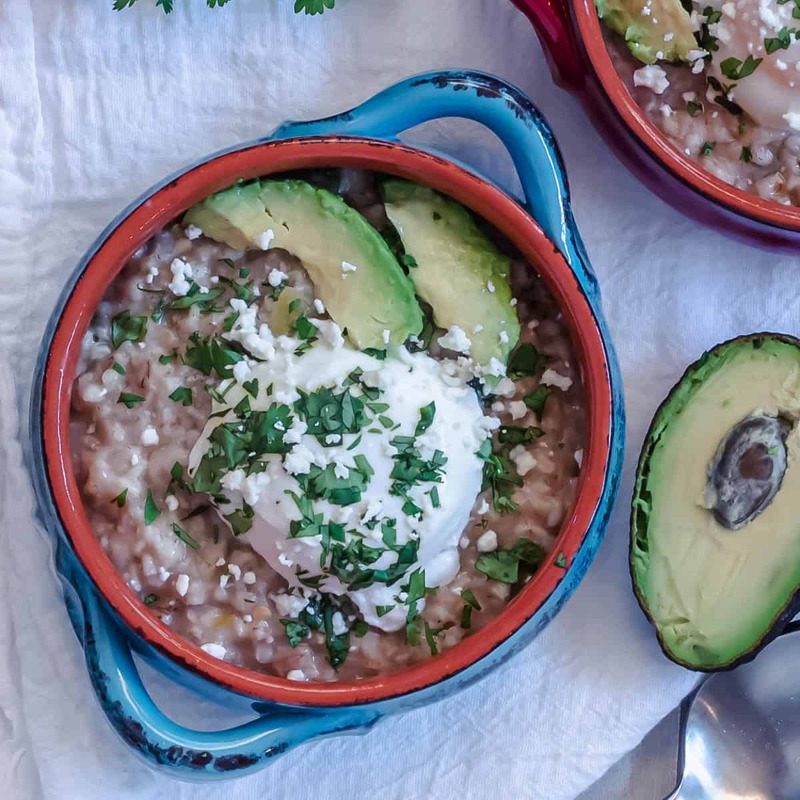 This is comfort food with some amazing Mexican flavors that your whole family will love! Gulf shrimp marinated in a citrus, garlic, and achiote oil mixture, sit atop queso fresco and green chile polenta, and get topped with luscious roasted salsa verde, a dab of red chile purée, and fresh cilantro… Green Chile Polenta With Citrus Shrimp is an elegant and flavor-packed dish perfect for a special occasion! Roasted Hatch chiles are one of my favorite things and I am always looking to incorporate the peppers into new recipes. 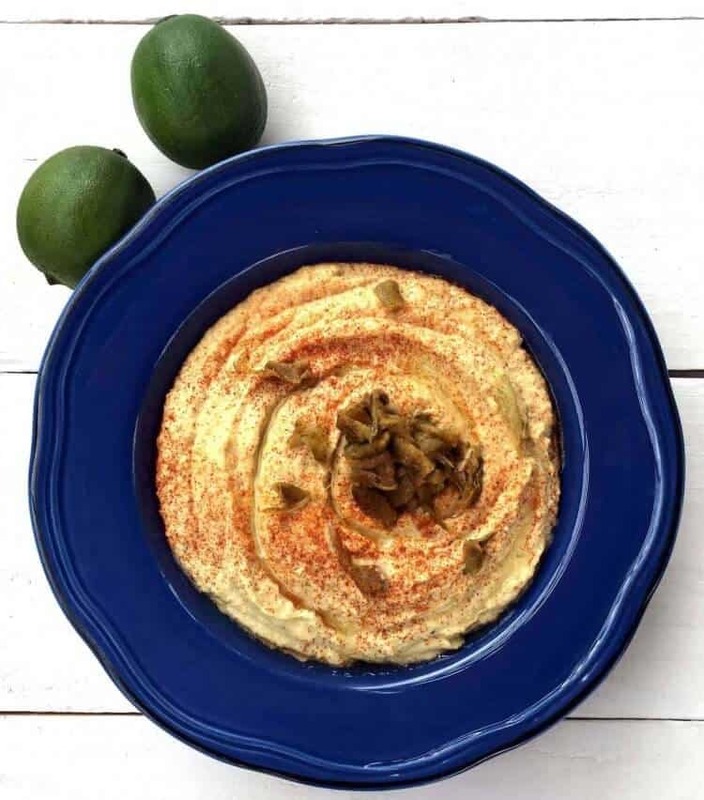 Roasted Hatch Chile Hummus has become one of my favorite ways to eat them as well as the favorite hummus recipe in the house. 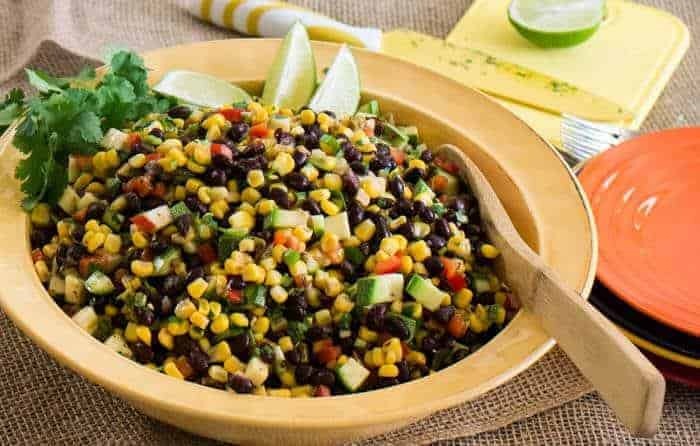 Roasted Hatch green chile is the star ingredient in this zesty, Southwest Black Bean, Corn, and Green Chile Salad! Dressed with a light lime and toasted cumin seed vinaigrette, this salad is a perfect side for dinner, a stand-alone light and healthy lunch, and a salsa for fish tacos. 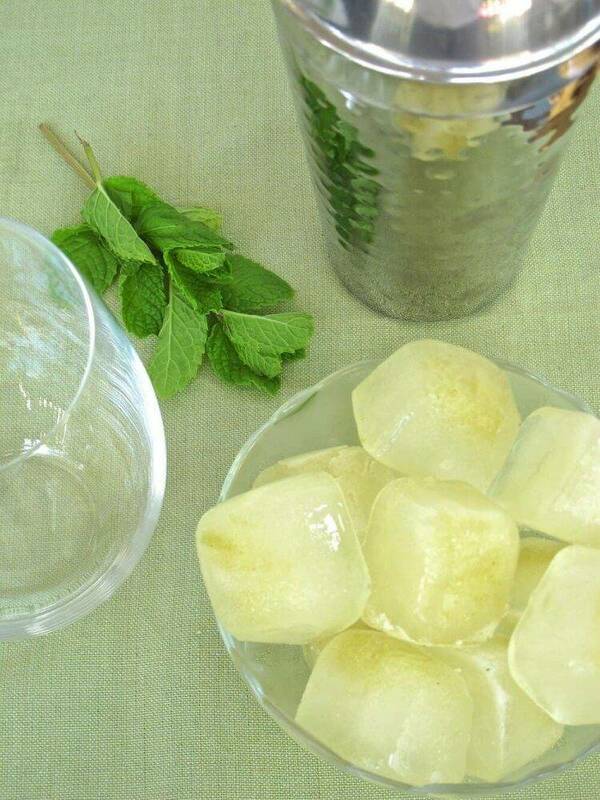 Think of all the possibilities for these zesty Hatch Chile Ice Cubes! An adult beverage gets my vote! 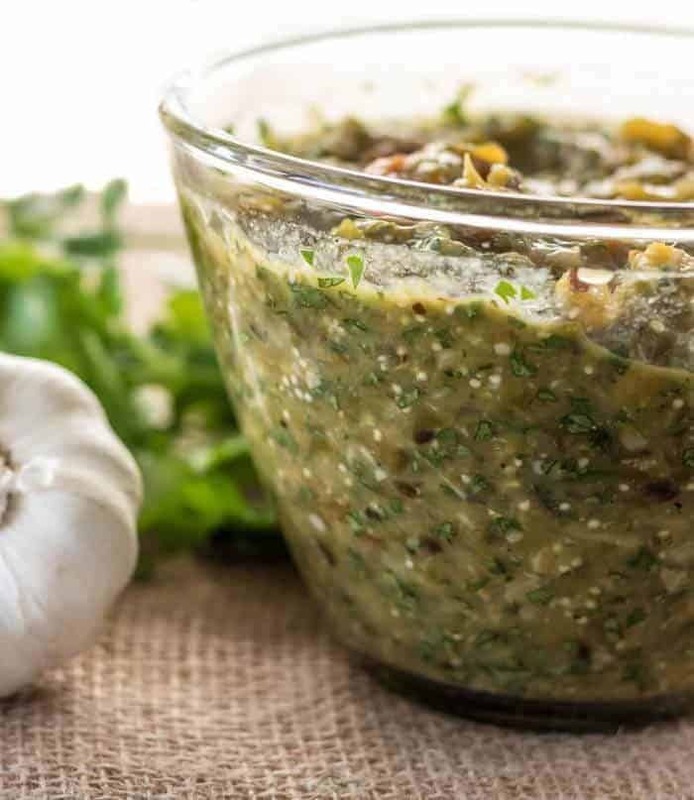 My Roasted Tomatillo and Hatch Green Chile Salsa is so versatile… Try it with chips, on your favorite taco, or as a finishing sauce on Mexican spice rubbed and grilled pork chops! My family is from New Mexico. Every year someone is kind enough to ship me Hatch or Chimayo Chiles...to Virginia....that I roast here on the grill, peel, bag and then freeze. The aroma is always amazing .. wonderful childhood memories. Thanks for these recipes. Will definitely try them! I just had red chile pozole on New Year's from a family recipe.... Soo good! Happy New Year! We're definitely connected through our love of New Mexico chile! I have to work harder to get them as I now live in south Texas, and 2 of our sons live in Charlotte, NC. Red chile posole is always a family favorite (and one of my most popular posts), and I will continue to do whatever I need to do to get those beautiful green pods, and that gorgeous earthy red chile powder! Thanks for taking the time to write in! Definitely, always interested in Hatch chile! This poor girl in south Texas longs for the sights and smell of chiles roasting in late summer! Thank you for including me in this great round-up! Pinned, stumbled, and tweeted. Scheduling a FB share for later this week! My pleasure Cynthia!I love your Egg Bites! Where did you get the muffin tins to create that shape? So fun! Great round up of chile recipes! We bought a case and roasted a bunch for freezing this year... bottom line... I have a plenty to make every single one of these recipes~. Thanks for all of the ideas in one place! Did you find them in California? Yay for fresh roasted and frozen in the freezer! They're so versatile and delicious... Enjoy! This round up of hatch chiles is making me so hungry. I love spicy!! Yay for spicy! I miss Hatch chile so much :-( Thanks for 2 fabulous recipes!